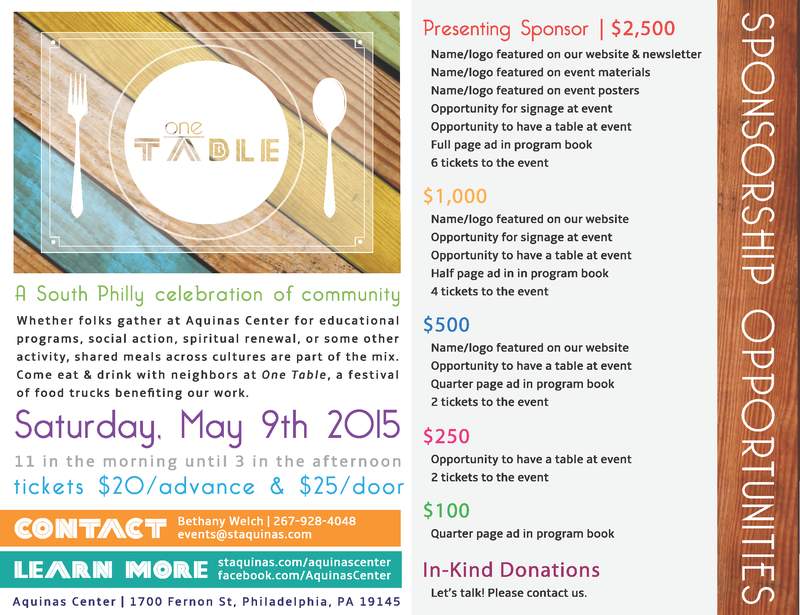 Join neighbors, friends, and supporters on Saturday, May 9th from 11AM-3PM for ONE TABLE: a South Philly celebration of community! This inaugural fundraising event was born out of many conversations about what makes our work unique. Everyone we spoke with identified hospitality and welcome—especially with food—as central to the mission. One reason this is so important is because of the diversity of people we see each day. Sharing food together bridges barriers of language, class, background, and culture. On May 9th, we will use the St. Thomas Aquinas parish parking lot and the center’s beautiful enclosed courtyard to host a singular event featuring food vendors and a beer garden (for those 21+). Come eat and drink with neighbors at One Table, a festival of food and beer to benefit our work. For a donation of $20, a guest receives two food tokens and one drink token. Additional tokens will be available. Should it rain, we have the large parish hall booked, which seats 300 comfortably. Tickets are available for $20 in advance or $25 at the door (if we don’t sell out before then!). You can get your ticket online here using a credit card or PayPal account. Or, pick them up during business hours at the St. Thomas Aquinas rectory or at Aquinas Center using cash or a check. To donate at specified giving levels, yielding both exposure and tickets to event, click here. Buy an ad in the program book for your business or organization or simply to share what you love about South Philly. Click here for the program book ad form. Stay up to date on what delicious food will be available, learn about new sponsors as they are added, and watch for photos of how the day comes together. Invite others to join you at One Table. Click here to find the facebook event. This great day won’t happen without marketing folks, raffle ticket sellers, ID checkers, set up team, clean up team, and more. Sign up now.